Mission San Fernando Rey de España was founded 8 September 1797 (17th in order) by Padre Fermin Francisco de Lasuén. 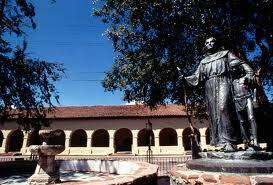 The mission is named for St. Ferdinand, King of Spain (1217-1252). The Indian name was Pashecgna. A variety of problems, including the 1812 earthquakes and the digging up of the church floor by gold prospectors when gold was discovered nearby caused much of the mission to fall into disrepair. Some restored structures include the church, monastery and some quarters around the quadrangle. The church is active. The mission is located in the middle of the triangle formed by Interstate 5, Interstate 405, and the Simi Valley Freeway (California 118) at the North end of the San Fernando Valley, to the North of Los Angeles. Navigate to this area and find your way to Sepulveda Blvd. heading North (there are many ways to do this so you’re on you own). Turn right at San Fernando Mission Blvd. just past where Sepulveda crosses under the 118 Freeway. The mission is a short distance on the left at 15151 San Fernando Mission Blvd. (California Landmark 157). GPS coordinates for the entrance: 34°16’08″N 118°27’55″W.